Often time the best names are those that are derived from your dog's behavior. Behaviors and personalities of hunting dogs tend to differ from Grandma’s lap poodle. Something about jumping in and out of truck beds triggers a need for a new breed of name list. We set out to create the best hunting compilation known to man. A dog’s name speaks volume about character and discipline and you want your dog to be disciplined. This page is comprised of great names that your pal can take pride in. 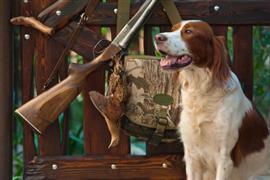 Whatever vermin or fowl your dog will hunt, a well deserved name can be found within this page. Pick one of your favorites and take it to the hunt. Some of our pages will contain a subcategory. A subcategory is a slightly more specific grouping than the main topic of the page. For a subcategory, we will include a separated table of names and corresponding descriptions. An example of a subcategory of Red Dog Names would be 'Dog Names Inspired by Red Wines'. If you have any subcategory ideas for the Hunting Dog Names page, we would love to hear them. Use the form below to submit your ideas.